I started making veggie fritters and croquettes quite a lot when I was weaning Little Whisk because they are great finger foods and good for baby-led weaning. I found that they were a winner with the whole family so I still make them often using different variations of vegetables. I like them with some salad, Mr Whisk likes them with fried eggs on top and Little Whisk likes them with a dip. They are really flexible and a great way to use up any vegetables that you have in the fridge. In this recipe, I have included cheese because I think that it makes them that bit yummier and more appealing for Little Whisk, but if you are looking for a lower calorie alternative then they are still very tasty without. Add some fresh herbs or some spices to enhance the flavours depending on what vegetables you use. 1 Large handful of herbs, chopped. I like to use coriander because it is my favourite. This recipe really is so simple. Just mix together all the fritter ingredients in a large bowl, I normally mix first with a wooden spoon and then use my hands to bring it together and ensure that the egg and flour is mixed evenly throughout. Heat a little oil in a large frying pan and then drop a heaped dessertspoonful of the fritter mixture into the pan. Use the back of the spoon to shape it into a round flat disk about 1cm thick. Fry for 7 - 8 minutes on each side until golden and cooked through. Transfer to a warm oven whilst you cook the rest. To make the lemon herb mayo simple mix all the ingredients together and keep in the fridge until you are ready to serve the fritters. 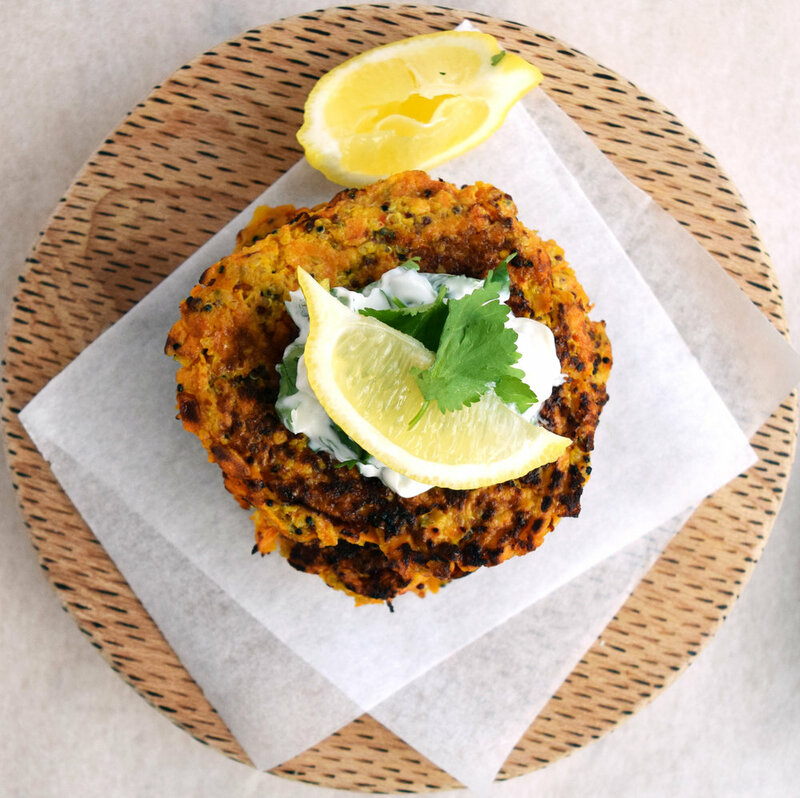 Tasty vegetable and quinoa fritters with lemon herb mayo.